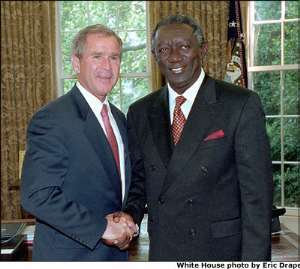 Accra, Nov.4, GNA - President John Agyekum Kufuor, on Thursday sent a congratulatory message to President George Walker Bush on his victory in the 2004 United States General Election. A release from the Office of the President said: "Your Excellency, it is with great pleasure that I extend to you on behalf of the Government and people of Ghana and in my own name, warmest congratulations on your re-election as the President of the United States of America. "Your resounding victory is a clear affirmation of the approval of the people of the United States for your leadership. "I am convinced that under your able stewardship, the United States will continue to lead the world in the search for peace and security and global prosperity. "Please accept, Your Excellency, my best wishes for your personal well being and the prosperity of the people of the United States of America".